For years, Barbie, Disney or Racecars have been the ongoing themes for our kid’s bedrooms. For the most part, all of these are still excellent fallback ideas for creating a fun place for your little one to sleep and play. However, just as times change and mature, so do our children. Lets face it parents, our 3 year olds know more about using our iPhone than we do. Due to interactive learning, the internet and other media devices our kids are usually on top of every trend. Instead of choosing a predictable, cartoon theme, parents are now looking for ways to snaz up their kids rooms in different ways. Perhaps a peaceful zen rainforest theme, or a pastel, Marie Antoinette inspired décor. No matter if the direction is modern, traditional or vintage, this season spice up your youngsters room with a bold, black and white rug or stay within the categories you started with. Black and white solid rugs may not seems like very kid friendly colors, however designers agree that this is a great way to incorporate bold patterns, designs and themes without going overboard with an area rug. Stripes, chevrons and florals are just some of the patterns you can expect to see this season in rugs. If black and white isn’t on your list of favorites, animal prints are also a great way to add a little excitement (kids love it too!). Choose from subtle, earthy tones or contrasting zebra or leopard prints. 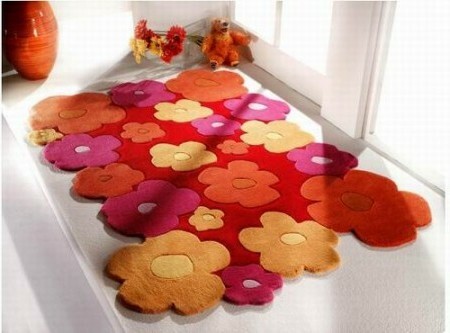 Shaggy Rugs are also a great way to add style but help protect your carpet or hardwood. Our little ones are notorious for spilling, coloring and staining floors. Experts suggest purchasing a few different fun and affordable rugs that you can use interchangeably. Not only can you switch them up for every season, you can rest assured that instead of spending hours on your knees cleaning, a quick switch up will do the trick. If you are unsure of the size or the style of the area to fit your child’s room, the professionals at Rugco, an Orange County rug store can help. Simply bring in a photo and measurements of the room and they can help you choose the perfect rug(s) that will compliment your special space, after all we only have the little ones for a while, we might as well make their fantasies a reality while they’re with us.